Supreme Court rules government must not fund yeshivas for students who have not enlisted in the IDF. The government must stop providing funds to yeshivas for students who have not enlisted in the army, the Supreme Court ruled Tuesday. A panel of nine justices issued the ruling as an intermediate order in a current appeal. An appeal has been filed calling to enlist hareidi-religious men to the army immediately. The ruling was issued despite a decision by Defense Minister Moshe Ya'alon to postpone the enlistment of full-time yeshiva students until April 2014, pending the expected passage of legislation on the matter. They noted that the ruling does not pertain to students who did not enlist “due to reasons pertaining to the individual student.” The ruling pertains only to funding provided by the Education Ministry to yeshivas, they wrote. The court’s decision will strip many yeshivas of the majority of their state funding. It will have a particularly strong impact on the hareidi-religious community, where many young men do not enlist for ideological reasons. The appeal which led to Tuesday’s ruling was filed by multiple organizations, among them the Movement for Quality of Government. 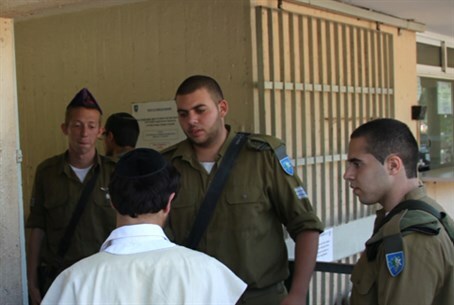 The groups argue that since the Tal Law, which allowed full-time yeshiva students to delay military service, has expired, and no new law has been created in its place, hareidi-religious yeshiva students should now be enlisted like other Israeli youth. Israeli men who are considered eligible for the draft can be jailed for refusing to enlist. So far only a handful of hareidi youths have faced jail over enlistment issues; those cases in which youths were jailed sparked heated protests. Hareidi-religious Members of Knesset responded to Tuesday’s ruling with criticism of the Supreme Court. His fellow UTJ MK, Yaakov Asher, said the court’s intervention was unusual. “The court rarely intervenes when the Knesset is close to legislating regarding the matter at hand,” he said. The ruling will add to the feeling in the hareidi community that it is under attack, he warned.